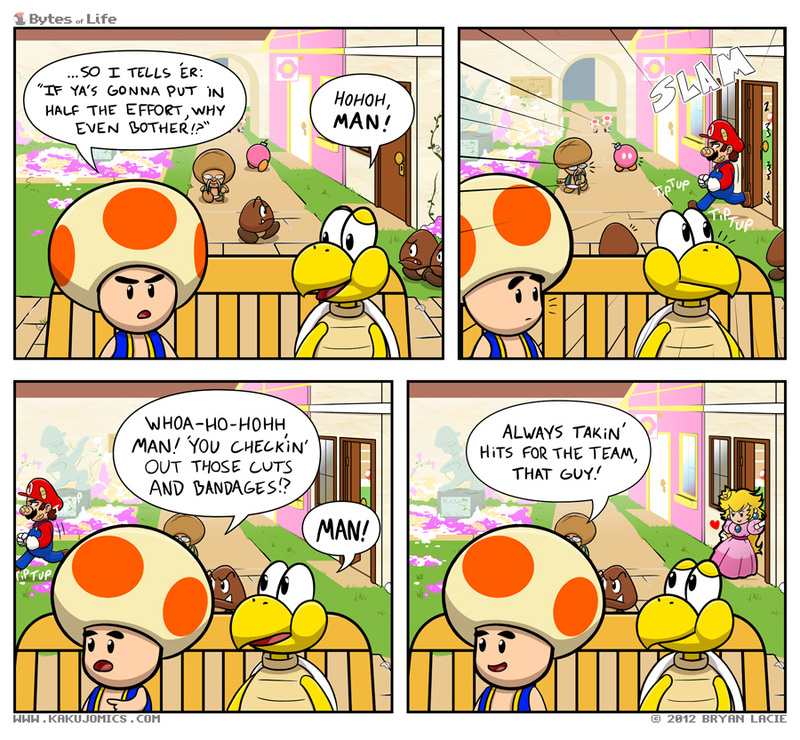 Sometimes, even Mario needs to get some satisfaction. He saves Peach, EVERY TIME, and then she, what, gives him a light peck on the nose and flies back to her castle to bake cakes for the next time Koopa kidnaps her? PSH. Mario needs love. I updated the site header to better reflect what the site is actually about. The old header/menu just looked remarkably generic, but I’m very happy with this one. You played Skullgirls, yet? If you like fighting games, you should check it out. I’ve only spent maybe an hour on it (I wanna save my first playthrough for an LP with my sister), but it’s a very solid game. They only had so much time and budget, though, so some features went missing (Like a movelist? What the hell?). They DID say, though, that they’ll release a patch for it AND various DLC if it sells well. And MAN, do I hope it sells well. I WANT MORE CHARACTERS. Updates have made a full return on my gaming channel. The two retro spots have been put on hold while I finish up some other games(Sonic Generations is back~! ); five is QUITE enough to keep me plenty busy. Fez is still incredibly fun! I’m getting better about focusing and keeping a schedule with my comic and video stuff, lately. Procrastination is an evil I too often succumb to, but I’m trying, y’know? Either way, Tuesday updates are a go, so you can always expect those, from now on. As I’ve mentioned before, all the sporadic updating has had the happy side-effect of allowing me a formidable joke database. I have comics lined up for, like, ever. So yeah. With the site looking oh, so spiffy and everything slowly coming together, I once again feel invigorated. I’ll do my best to keep this energy up. Or, you know, drink coffee. Also, am I the only one who finds it a little suspicious that Peach keeps getting “kidnapped” by Bowser? If I had to “save” my girlfriend from some “evil guy” over and over again, I’d be getting suspicious. I see what has been done here. And I find it very funny. “Taking hits for the team.” Very clever. Great comic. I don’t understand taking one for the team meant?.. I see what youve done here, good… very good. I may not have got it the first time but once I remembered what paper peach looked like I did indeed giggle.